Insurance Dispute, What Are You Entitled Too? Home > Insurance Dispute, What Are You Entitled Too? Being involved in an accident, is very disruptive and in many cases the settlements unjust. There are ways for you to protect your investment and recover any losses, but most folks just aren’t willing to have the proper insurance coverage to “Replace” there vehicle. When you purchase insurance there are 2 terms that are important to understand, “Replacement value” and Fair Market Value” sometimes called Actual Cash Value. Most people have insurance that covers the fair market value of their car and the same is true for the person that has hit you in an accident. These insurance polices are made affordable because the fair market value of your car is depreciating and the more time that goes by, the less an insurance company is going to have to pay. This makes insurance affordable and until you have a claim the value of your vehicle is assumed. As soon as you have a claim the at fault party insurance first has to determine if it’s going to be cost effective or not to repair the vehicle, in either case they pull up a value guide, input your car and determine the average value f a vehicle like yours. It’s a no brainer, they will choose to repair your car if it’s cheaper than replacing it. If they decide to total the vehicle, they are going to offer you the lowest amount to settle the claim, this lowest value is going to be the lowest fair market value, not the replacement cost. If you have insurance for the replacement value, you already have agreed with the insurance company on the replacement value when you bought the insurance and you wouldn’t be going through this process. This type of insurance is called “Agreed Value” and is typically only available on collector cars and high-end cars that are driven very few miles and secured when not in use. 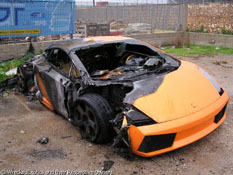 Understanding that you are only entitled to recover the fair market value of your wrecked car, its very tough for an individual who has invested a significant amount of money why they can’t recover what they have into their car on the claim. In short , what they have bought to customize or upgrade their car is used. It can’t be removed and sold for what you bought it for. Wheel and tires cost a lot of money, but once you use them you can only sell them for pennies on the dollar. You can only claim the fair market value of these customizations and upgrades. Consider paint jobs, on a typical can a paint job can cost you thousands of dollars, but once applied to you car it not worth anything to anyone else and may only increase the value of the car a couple hundred dollars, the insurance company is not going to pay for the full value of the paint job. The lesson from all this is to set your expectations on recovering the fair market value of your car, not everything you have invested in it. Read your insurance policy and understand the cover you are buying and what you are entitled to recover, if it’s inadequate talk to you insurance broker and find out how to get better coverage. Protect Your Investment, Get It Appraised! (949) 387-7774 Join the Auto Appraisal Network team! Please provide your contact information and we will email you detailed territory information shortly. Are you a US Military Veteran?